To promote this specific mode, the developers have announced an interesting offer. They will randomly choose five people among the gamers, who have shared the mode's video via the social networks. These persons will be able to get a pig. A real high-quality pig. 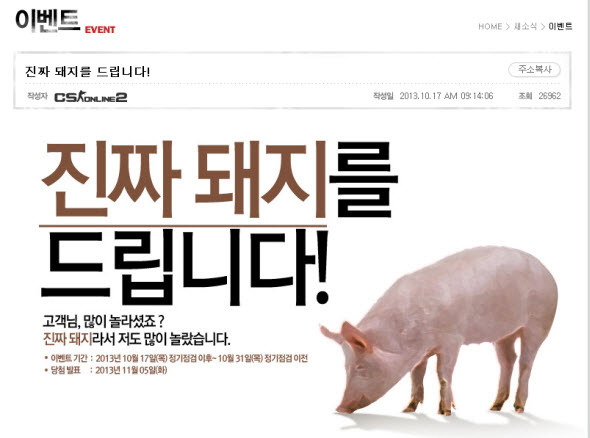 Alive 110-kilogram weight swine will be shipped to the houses of the lucky winners. If you are not good in animal breeding, then the developers can cut your prize and send you meat. And for the laziest gamers there is a third option - the barbecued swine will be delivered to your house. What a pity, we are not in Korea. Do you feel sorry about it?